Chris Ryan | Cycling, Tech, Wine, &c.
There has been much discussion about how 2016 was rough: mostly because we saw Donald Trump elected President of the U.S. People talk about a “post-truth” era, and shake their heads. And yet, many of these same people, those I know, are posting stuff from charlatans like David Wolfe and Deepak Chopra; anti-GMO memes; and other unsubstantiated or demonstrably false nonsense. I have encountered, just in the past year, someone who works in the fitness industry who believes that the topical application of a cream can cure gastro-intestinal issues; people who read and believe horoscopes; and even a couple who question climate science or where and how our species originated.These people all believe themselves to be liberal, even sometimes radically so. But they are not: their beliefs are deeply conservative, stubbornly and religiously resistant to even the simplest check against current, and often longstanding, knowledge through a bit of reading or even, in many cases, a quick (well-informed) web search. In many or most cases, and I’m tempted to say particularly when it comes to GMOs, the level of knowledge is essentially zero. This has always concerned me, but in the current climate it worries me even more. I think that if we don’t do the work of finding the truths “we” collectively actually do know—which often takes no more than a few minutes—we are, and I don’t use this word lightly, literally doomed. I am not saying I’m perfect or an expert in all areas. But that is precisely the point: I am open to new information. I want new information. I’d like to challenge everyone, and I include myself, to question everything and stop making assumptions this year. It’s more critical than ever. In 2015 I joined a cycling group (OvCare) and did the Ride to Conquer Cancer, Vancouver to Seattle (see my post on that trip). It was a good year, and a decent introduction to more serious road cycling, after cycling a fair amount through my life. But at the end of last year, I didn’t have a Garmin or speed and cadence sensors; hadn’t been in a group with an experienced coach; and didn’t know what FTP was. I was cycling blind, just “bike riding” really. 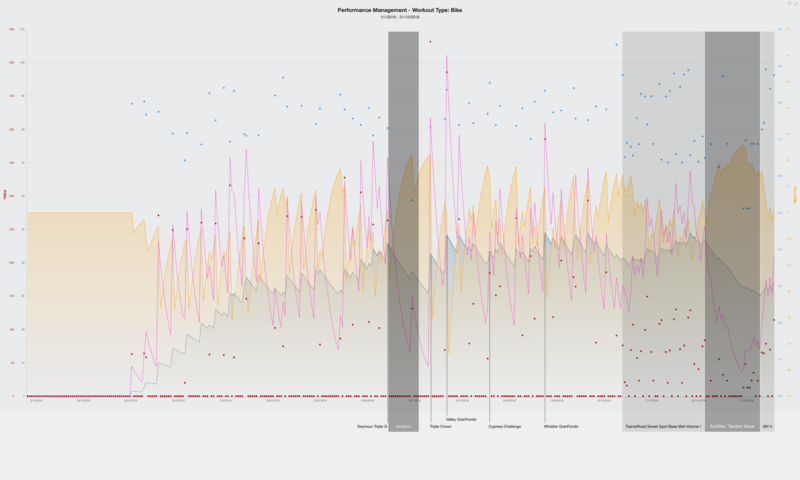 The Whistler GranFondo (Strava link) was the culmination of my group training with Paul Moffat‘s Velosophy group. It was slightly easier than I’d expected (or feared? ), and I came in at about 4:33. Most of the ride went well; I sagged a bit in the last 10km or so, which I think was a combination of inadequate nutrition—I have to learn how to eat more on these long rides—and my seat (I’m trying different ones over the winter). I was well-prepared overall, and I suspect one of the things that really made a difference was that I didn’t drink any alcohol for ten days preceding the race. As a result of that experience and the TrainerRoad article “Is Alcohol the Reason You’re Not Getting Faster?” I cut down even further on drinking. The Fraser Valley GranFondo (Strava link) was tough, but notable in that it was the first GranFondo I completed. I’ve written about my struggles on this ride here: see 2016 Fraser Valley GranFondo. I bought a Wahoo KICKR early in the year and did a couple of FTP tests on it, but it wasn’t until October that I really started to utilize it. I’ve actually enjoyed the indoor rides, and I think it’s really making a difference in my form and endurance. Unfortunately, I had to take four weeks off as I strained my Achilles’ tendon a bit. I’ve written about my crash in August and won’t add much here other than that I’ve pretty much fully recovered; I have a bit of a remnant, maybe scarring, and some slight discomfort if I lean too heavily on my right arm where I hit the pavement. By the end of the TrainerRoad “Sweet Spot Base Mid-Volume I” training program, which I did through October and November, I had developed Achilles’ tendon issue. I went to physio and only did some light rides; over time it improved and actually prompted me to make some adjustments in my pedalling technique on the left side. The other low point this year was the Triple Crown (Strava link). I was jet-lagged, trying to fight off a cold, and I got two flats. It is a tough enough ride as it is, and I expect it’ll go a lot better this year if I take it on. What a difference a year makes: I’ve come a long way in just twelve months, I am very much looking forward to 2017. I’m considering which events to participate in; I may do the Fraser Valley again or perhaps the Okanagan one (my sister lives in Penticton). I am thinking that a fully-supported ride like Trek or Haute Route might be a great vacation. And I want to see how well I can do to Whistler: as close to four hours as I can. I’d better stop writing and get on my trainer. It was inevitable. I knew that, but I had put it out of my mind and only fully realized it later. On August 6 I was out with Paul Moffat‘s Velosophy crew and we had just had a nice run from Vancouver up to Lions Bay and back. We were headed towards Cypress to do some intervals. Everything was going smoothly along the Upper Levels Highway, just east of the Westmount/Westridge exit. I was right behind the lead rider, maybe 30cm. I had a quick drink from my bottle, reached down to put it back, couldn’t find the cage. I looked down, put it back, looked up, and … overlap. The crew walked down to the exit, and I cleaned up a bit at the gas station there (several customers very kindly offered me bandages and antiseptic). I was high on adrenaline, feeling great: part of this was clearly relief at having escaped without any broken bones or worse. But also shock, probably. Paul stayed with me until my girlfriend came to pick me up. I cleaned up at home, but had a fairly normal night, and I went out for dinner, while making sure to wear long sleeves to avoid shocking people too much! It wasn’t until the next day that the aching set in. Advil and rest did the trick. But I still feel fortunate, and three weeks later the scabs are almost gone. Focus. Every second is critical when you’re rolling along so quickly. This is my first serious year of cycling, and I’d obviously started to take some things for granted. By summer, we were cycling more quickly, and closer together, than we had been in early spring. The decreased margin for error had sneaked up. In future I’ll leave some room if I really need to drink or eat, or just wait until hills or more social parts of a ride. Can I get back on my bike yet? Be at 100%. Preceding the ride I’d had a week of making up training sessions at the gym from a vacation. I was nursing a slightly sore knee. This kind of deficit may not even be entirely obvious, but it’s important to be aware of your condition and how it may affect your ride, and your team’s. Recover. Take care of yourself following a crash, but make sure you get out on your bike again, re-acclimatize, and rebuild confidence; apply the lessons you’ve learned; and talk to your coach, if you have one, about the incident and how you can improve. You may crash again—arguably, you almost certainly will—but you can work to reduce the likelihood. You’ll re-learn to trust yourself, and your fellow riders; and you may have to do some work to regain their trust as well. Thanks to Paul Moffat for reviewing a draft of this post. I cycled my first Gran Fondo, the Prospera Fraser Valley, on July 24. I rode the Ride to Conquer Cancer last year, but the first day of that ride was cut short by weather, and the second, while 133km, was slow as I was with a friend, and I hadn’t yet become serious about cycling: I was riding blind, without sensors. This year I’ve been training with Paul Moffat‘s Velosophy group. In the Fraser Valley I was aiming for as close to five hours as I could get. The first 90km or so went well: I maintained an average speed of 33km/h, felt pretty strong, and joined a couple of good pelotons. My bike performed well: I’d had two flats on the Triple Crown the week before. But after about 100km, while I don’t think I bonked exactly, I found the going pretty tough. What happened? I thought I’d compile a list of mistakes I made and things that went wrong, both for my own benefit and for others embarking on their first long ride. I didn’t eat enough. I was well-stocked with enough carbs for five or six hours, but after my first couple of bars (Pro Bars, which are great) I found it difficult to get them down. A greater variety of food, including some bananas, for example, would have helped. I think I had enough water with me: a bottle with Vega electrolyte hydrator; and two with Gu‘s Roctane Energy drink mix. I didn’t stop enough. I cycled non-stop for 137km, at which point I re-filled my bottles. As a result, I missed out on some fresh food (such as bananas), dropped out of a couple of good pelotons when they pulled over at the earlier rest stops, and perhaps simply missed out on having a couple of needed breathers. I rode alone. In a group, you can save up to 30% of effort. As a long ride progresses, it’s probably natural for cyclists to space out to some extent. But in my next GranFondo I’ll be watching for and sticking with an appropriate peloton. A couple of physical issues. My left knee, hurting a bit after the Triple Crown, started bothering me again; and my right quad cramped up a bit. I’ll be seeing a physiotherapist. I finished in about 5:55—well off my initial target, but perhaps almost respectable for a first-timer. Looking forward to Whistler in September, I’ll be sure to address the points above.